Books are making a comeback in Korea. In a nation where people seemingly prefer smartphones over books, neighborhood bookshops are attracting foot traffic all over the city. Among online bookshops and large chain bookstores that dominate the book industry, clusters of independent bookstores are forming a market of their own. Independent bookstores not only provide hard-to-find books, they also challenge the traditional role of the bookstore and experiment with new modes of book production and sales. In other words, they are more than places to just buy books; they are incubators for creative approaches and new opportunities. 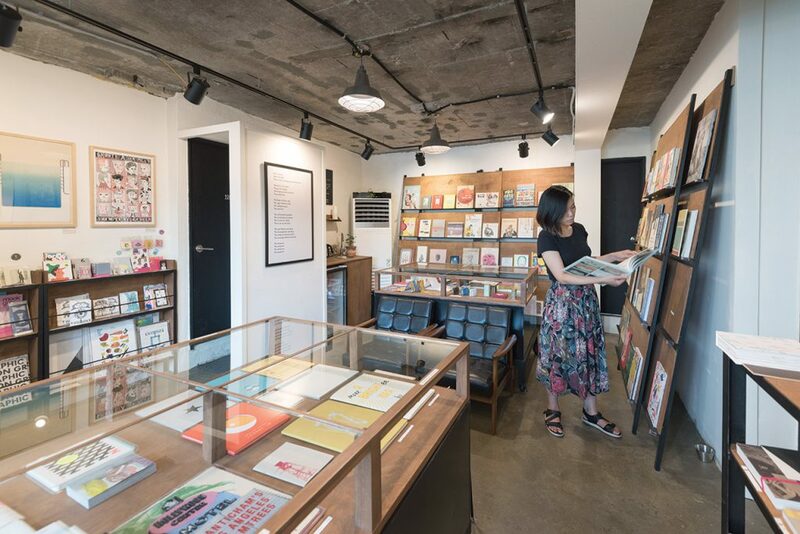 Located largely in trendy neighborhoods of Seoul, independent bookstores are becoming new cultural hot spots. This philosophy fuels the independent bookstore boom. Independent bookstores represent spaces “independent” from mainstream standards. Instead, they reflect the bookshop owner’s taste and curatorial skills. While large chain stores gravitate towards best-selling titles and focus on sales, small bookshops boast carefully curated book collections that include titles uncommon in chain stores. In a city full of trend-savvy and experience-oriented residents, independent bookstores are an exceptional alternative to the cool café next door. Young people flock to these bookstores for an enhanced reading experience. After a grueling day at work, visitors can relax and find solace in books that speak to them. Many of these shops are in the trendiest neighborhoods like Hongdae, Seochon and Itaewon. The owner’s sensibility is evidenced through the books on the shelves, as well as through the space and interior design. Consumers find satisfaction not only in the beautiful books, but also through sharing their unique purchases and experiences through social media. 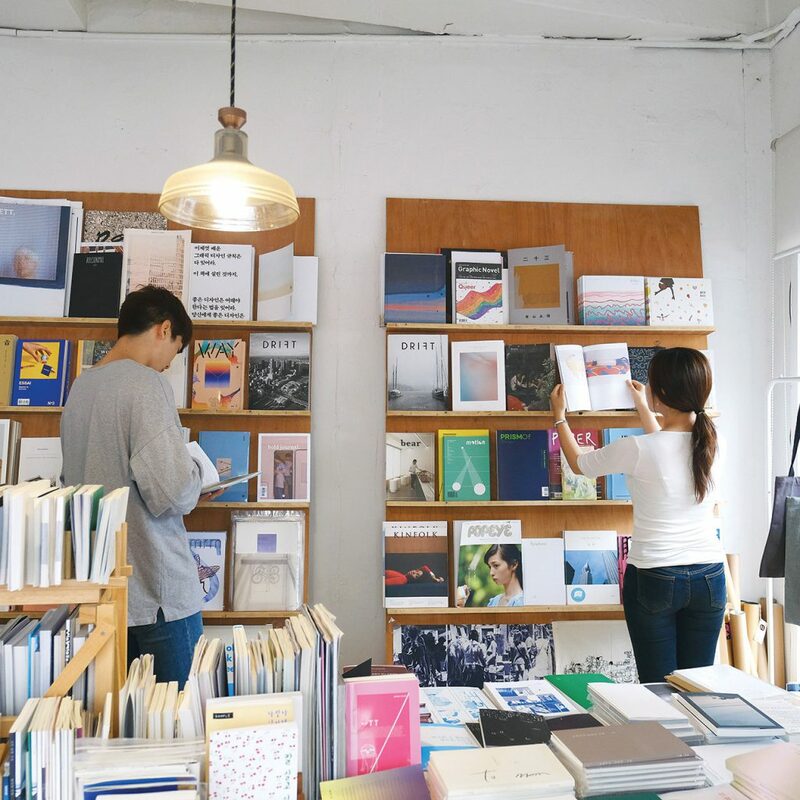 These experiences encourage visitors to seek out remote brick-and-mortar bookshops rather than succumbing to the convenience of online shopping. Some independent bookshops are so-called “concept bookstores” with specific foci. Themed bookshops with events and workshops elevate book shopping into a cohesive cultural experience. 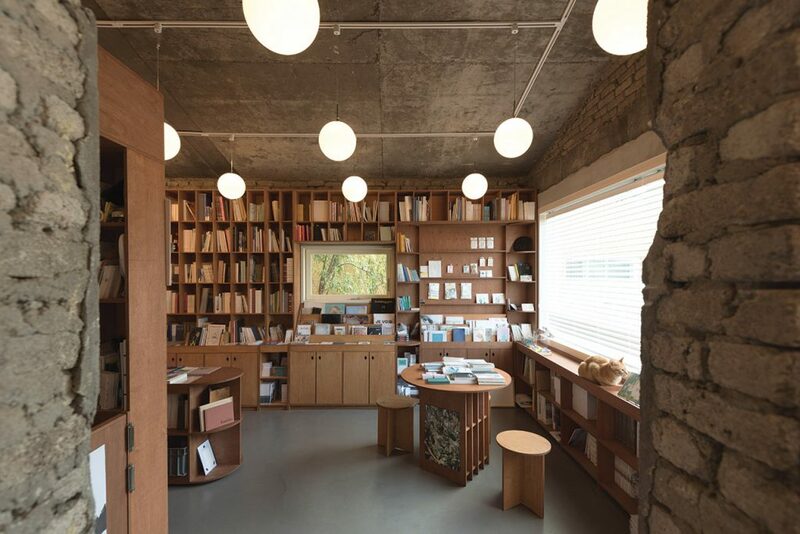 Sajeokin Bookshop, the name of which translates as “Intimate Bookshop,” is a private, by-appointment store in Mapo-gu that prescribes books to visitors after an intimate conversation with a book curator. In Book and Pub in Mapo-gu, you can enjoy your book over a nice glass of wine. 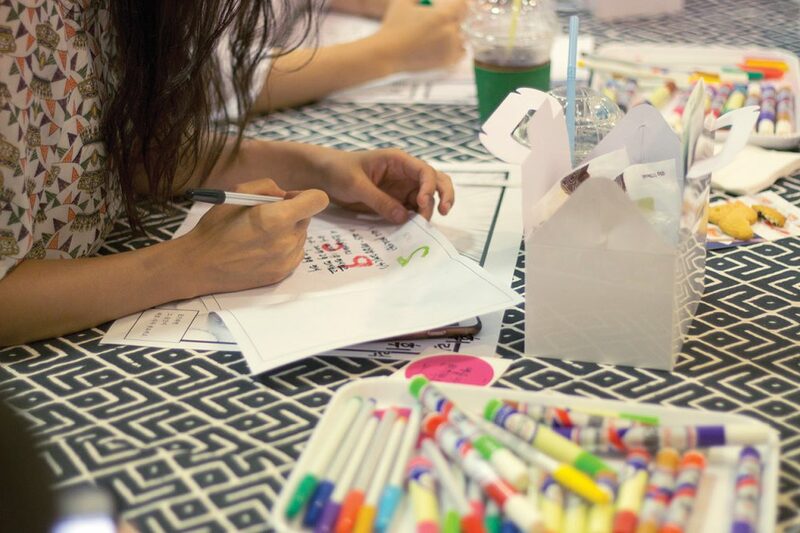 Storage Book and Film in Haebangchon hosts workshops for aspiring book makers. B-Platform, near Hapjeong Station, comprises a bookshop, art gallery and studio space where bookbinding classes take place. 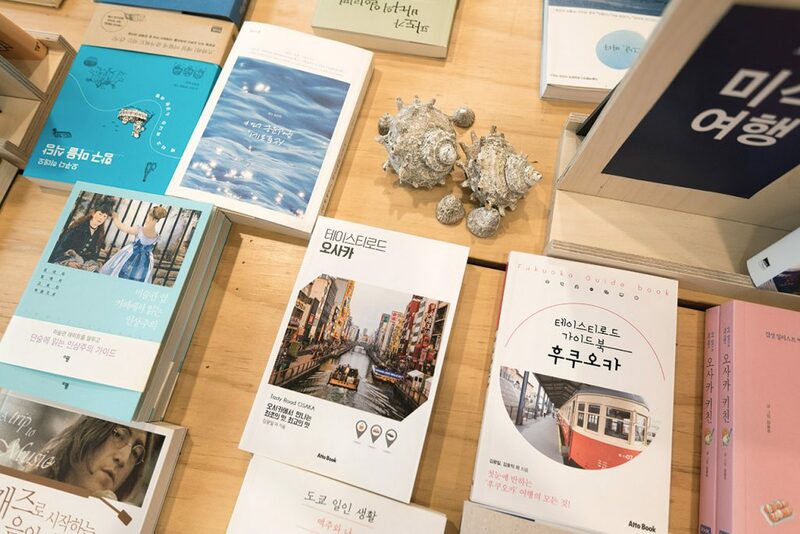 Saie in Yeonamdong perks the visitor’s wanderlust through a selection of travel books. Cat Bookstore Schrodinger in Jongno-gu carries only cat-related books for cat lovers. The list is endless and will continue to grow to satisfy individuals who crave new stories and experiences. Bookshops are not, generally speaking, cash cows. 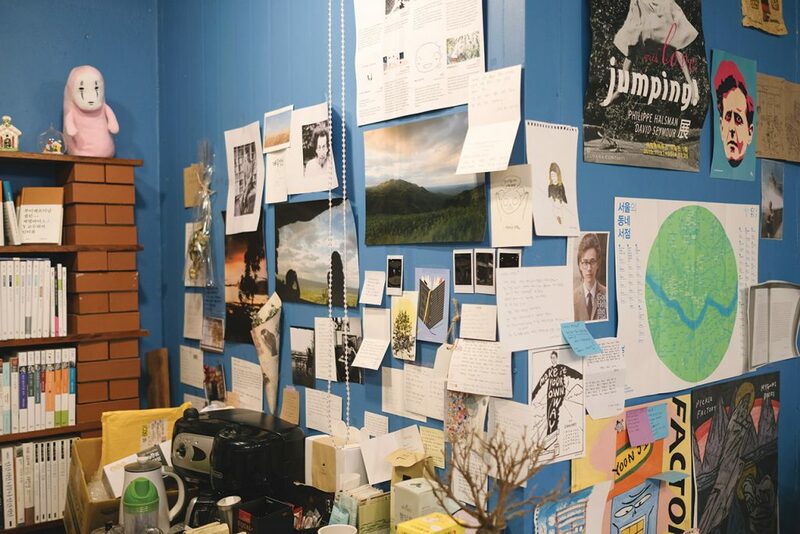 They are labors of love, built from scratch by people who chose the trade out of a passion for books and print media. This passion shines through each book placed in their shops. 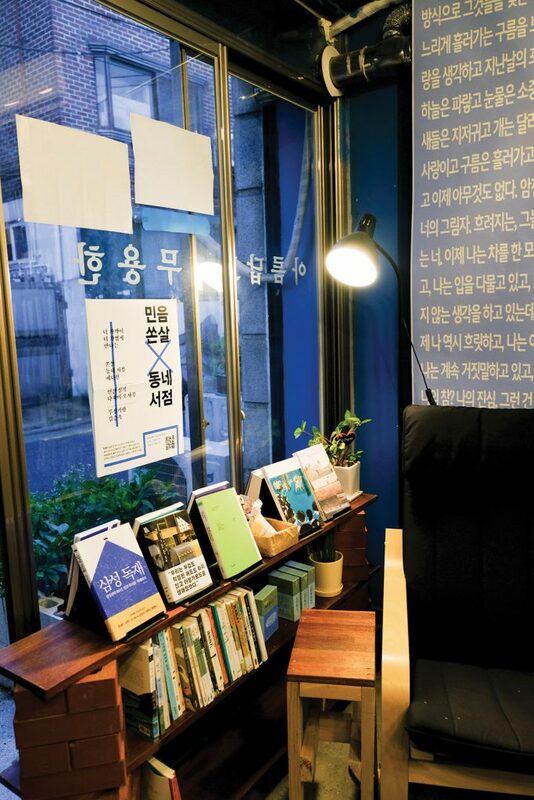 As resignation reigns among young office workers worn out by Korea’s demanding office culture, and a desire grows to do what you love, independent bookshop owners and independent publishers show you can forge your own path by following your heart. 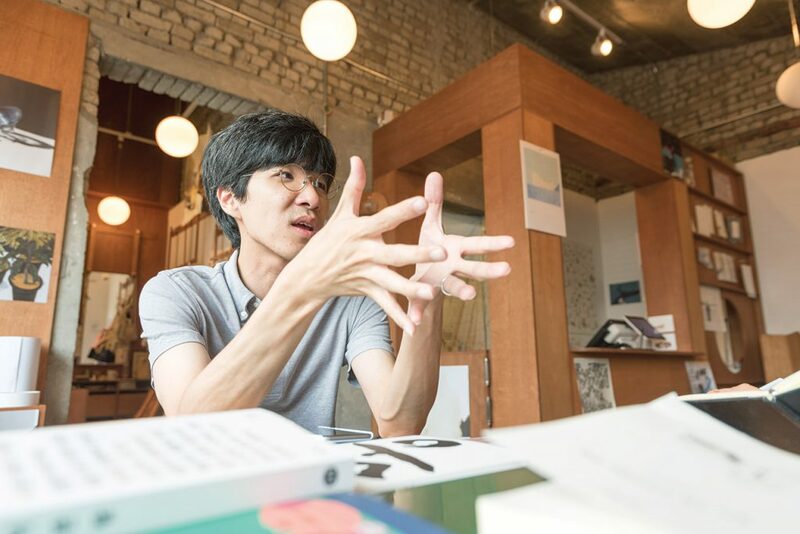 Ko Seong Bae, editor-in-chief of The Kooh, an independent magazine inspired by the Japanese otaku scene, and writer of many independent books, has a background in architecture. “Even when I was working, I wanted to learn things,” he says. “One of the many things I did was attending a magazine workshop. I made the first edition of The Kooh there. The instructors advised me not to quit my job, but I did soon after.” Now, he is a publisher, editor and marketer all in one. One such surprise came at this year’s Seoul International Book Fair, Seoul’s biggest book fair, held in June 2017. Over 200,000 people attended the four-day event. His shop was part of the special section called “The Era of Bookstores.” This program highlighted the vibrant local book scene by featuring 20 neighborhood bookstores around Seoul. Storage Book and Film was one of the most popular booths in the section. “The response was explosive and surprising,” says Kang. “I think we were well received because we produce independent publications.” Independent publications are one-of-a-kind products with unique layouts, concepts, design and packaging that challenge the format and content of books seen in large stores. Like the bookstores in which they are often found, independent publications cover topics and ideas that may not be presented in mainstream outlets. The concept and curation of independent bookstores ultimately reflect the owner’s tastes and preferences. Because they themselves want to read or feature certain books, they open bookstores to make these available to people. Likewise, independent publications offer content publishers want to share with readers. To sustain the independent market, the relationship between independent bookstores and independent publishers is critical. Independent publications engineer a new level of creativity beyond the plain reading experience. 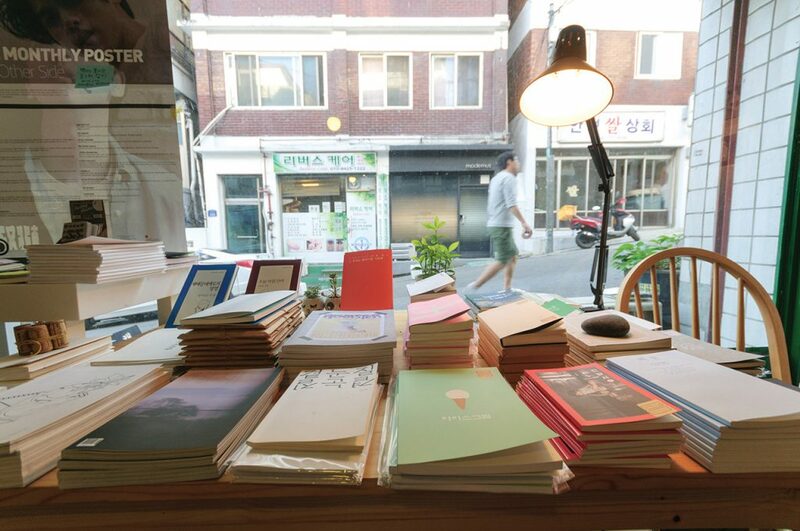 Iro, owner of Your Mind, a bookshop and publication located in Yeonnam-dong, has been a pioneer in the niche print market. Iro began selling art books and independent publications online in 2009. The following year, he opened a brick-and-mortar bookstore. For the past eight years, he’s hosted a one-of-kind independent festival called the Unlimited Edition (UE). The annual event, which kicked off humbly with just 900 attendees in 2009, grew exponentially over the years with 15,000 visitors last year. Last December, the eighth UE opened at the Ilmin Museum with over 200 vendors consisting of writers, artists, illustrators, photographers, designers and independent publishers. Iro is currently planning the ninth gathering, which will open at the end of the year. UE began as an attempt to answer a question commonly raised by customers of independent bookstores — who are the people behind these books?